Venerable tennis savant Bud Collins couldn’t be in the house for Sunday’s gentlemen’s finals at the All England Club (ruptured quad tendon), so estimable Wall Street Journal columnist Jason Gay was in Collins’s Brookline house to view it with him. His pants had bright red strawberries on them. Of course they did. His shirt was a confident pink, as were his Crocs sandals. In the kitchen, his wife, Anita Ruthling Klaussen, prepared the signature dish—strawberries and cream—just like they serve at the All England Club. 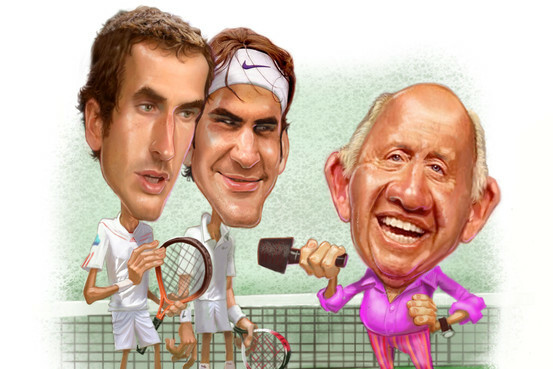 Bud Collins was ready for a Breakfast at Wimbledon. Of course, he’d never really experienced it this way, like the rest of us, at the coffee hour, back home. For 44 straight years, Collins had been at Wimbledon live, in London, close enough to smell the grass, chronicling tennis’s most prestigious tournament, pioneering a glorious morning TV ritual. Back in the old days he might take a champion to dinner, like he did with Billie Jean King. He would stay for years at the Dolphin Square Hotel, on a recommendation from Rod Laver. “I think it was about nine dollars a night,” he said. Over time, Collins, now 83, became one of the most recognized faces in the game, the sports columnist from Boston via Ohio, who made the then-uncommon leapfrog from print to television and helped propel a tennis boom in the U.S. He was a tennis player, writer, broadcaster, historian, courtside debriefer and a spectacular clotheshorse—his pants collection can be seen from the moon—but Collins’s true cosmic gift was his enthusiasm. He loved tennis the way Americans grew up loving World Series Game 7s or football homecomings, and he injected humanity, humor (those player nicknames!) and accessibility into a sport seen as distant and stuffy. Read the rest. It’s swell. This entry was posted in Uncategorized and tagged All England Club, Brookline, Bud Collins, Jason Gay, strawberries and cream, Wall Street Journal, Wimbledon. Bookmark the permalink.